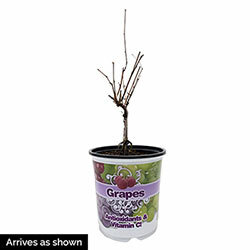 Pretty to look at and simple to grow, hardy Concord Seedless Grape is just as delicious when eaten fresh as when processed as a jam or juice. But without the messy seeds to strain or spit! 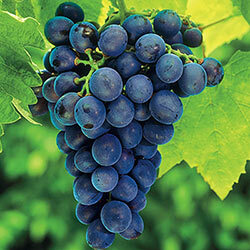 Fruit clusters are slightly smaller, deep purple in color and vigorous growers. Remove all flower clusters produced in the first year to encourage development of strong canes. In the second season, after removing all but four of the best side canes to form a "double T," choose a healthy, pencil-sized fruiting cane on each of the four arms and trim back to 8–10 buds. Now shipping, already established in a 1-gallon pot.